Words by RYAN SPARKS. All images screenshots from HOLLOW. The pace of life doesn’t move very quickly in McDowell County, West Virginia. In fact, it’s at a standstill right now. I’m staring at a beautiful, shallow riverbed in the woods, stuck in a moment between my introduction to photographer Alan Johnston and the other residents waiting for me to scroll into their lives. I’m visiting the world of McDowell County through the web-based documentary Hollow, which launched earlier this year and has been attracting audiences not just for the nature of its content, but for the amazing way it is contained and presented. 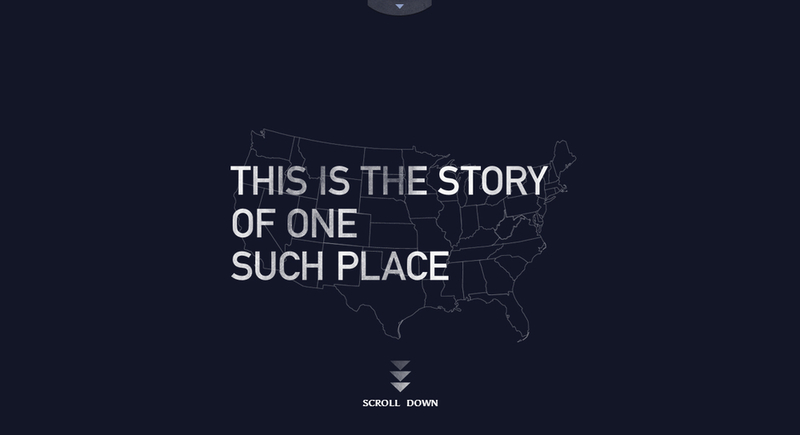 After loading each chapter, the user merely has to scroll down the screen to let the documentary unfold. Short videos and photographs provide the bulk of the documentary’s original content and message, but the transitional segments between the videos slide in a stylistically unique method that layers and dissolves contemporary and historical photographs, data points, and illustrations as the user rides the scroll. 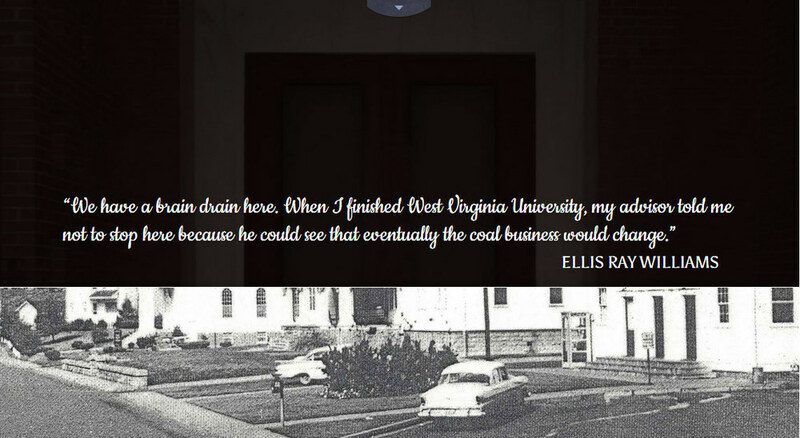 The opening sequence--a clever ride through the decades that presents the county’s history while a population counter constantly rises, then starts to fall--is a strong enough experience, but is really just a prologue that touches on what Hollow is really concerned with: family, community, and preservation in a place dominated by its reliance on the coal industry. McDowell County lies in the southeast corner of West Virginia, draped across some of the richest deposits of coal in the Appalachians. The town once boomed, and in order to meet the demand for labor, coal companies recruited men from as far away as eastern Europe. Then, inevitably, technology advancements and increasing competition brought a bust to the area. 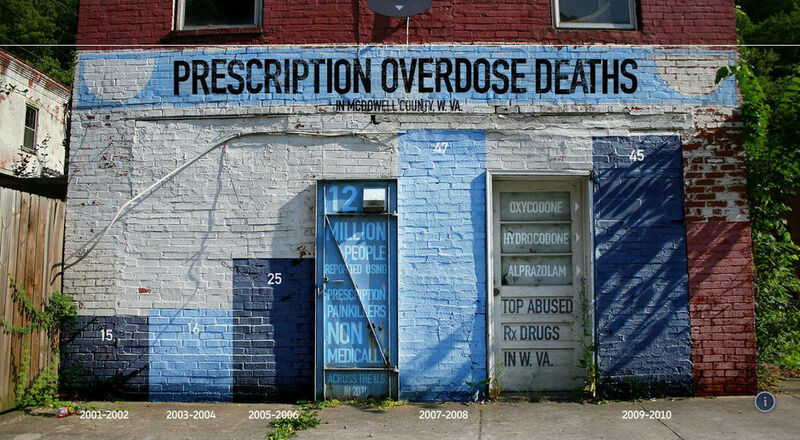 Drug use skyrocketed, particularly prescription painkiller abuse, as did the amount of people reliant on some form of governmental assistance. The documentary’s director, Elaine McMillion, grew up in the area herself, and, after graduating from WVU and going on to get an MFA from Emerson, she has since settled in Boston. Hollow evolved out of her early work teaching basic multimedia and journalism skills to locals to serve their own communities. After compiling hours and hours of footage and countless stills, she and her team set out to build a container that could engage users while presenting profiles of over thirty residents of the area, from retired coal miners to small business owners to children who are all involved daily with avoiding a tipping point for their communities. “It's awesome to have Hollow screen at the New York Film Festival and other events but the project really has a strong community backbone and is meant to bring people together locally and help to amplify their ideas and initiatives,” McMillion said. Hollow operates on a custom-built platform that relies heavily on the flexibility and features of HTML5, the latest standard of the markup language that most websites are written in. HTML5 has a broader flexibility to play video and audio, as well as display vector graphics and animations all within a browser window, not necessarily confined in smaller players. While people all over the world are experimenting with the language’s capabilities, Hollow sets a high benchmark for what a dedicated team can do with it in the realm of social storytelling. Babbling rivers, igniting rockets, and sizzling skillets are just a few of the details that are dropped into the transitions, all reinforcing the images and how the individual stories are linked. The simplicity of the controls are a major part of the Hollow’s success. The only decisions a user has to make are how much information to take in at one time. While Hollow is linear in its direction, a user can pass up a longer video or data set without feeling like they are stepping outside of the story. Hollow rides the rail and invites you to pay as much attention as you want and never punishes you for skipping ahead. Instead, it rewards patience and engagement. While the phrase “unlockable features” seems a little problematic in that Hollow is not a game, extra content is activated after a user sits through a longer video. While there is no one narrative, coal and family are dominant themes in each of Hollow’s five “chapters.” At its heart, Hollow is journalism, but the stories of real people gain a fuller color by being placed in such careful, attractive proximity to each other. Since the documentary launched, it has been viewed over 60,000 times from locations all over the world. McMillion reckons that a traditional film documentary, even one with the same aesthetics, stories, and music, would never have reached such a wide audience so quickly. Another advantage is that the world of Hollow will never be as far removed or self-contained as a film. With community updates and participation, the themes and issues highlighted can always be expanded. While they circumvent some of the traditional obstacles of distribution and marketing, web-native documentaries come with their own limitations. For instance, Hollow can’t work on anything but the latest versions of Chrome or Safari. There is no mobile version, and you’d be hard-pressed to enjoy it over dial-up or less capable broadband connections. This highlights another layer of dispossession people in rural communities are facing, since few providers see any reason to invest in bringing broadband into poorly populated areas. However, it doesn’t always take a project team and media architects to tell a story. Included in Hollow is one video shot by two boys, trained by McMillion, who interview each other while surveying an abandoned site of simple shelters. It was here where an annual Rocket Boys Festival would commemorate the work done by Coalwood, WV, native Homer Hickam, who experimented with rockets right in McDowell County and would go on to become a successful NASA engineer. The festival has since moved on to the relatively larger, more viable county seat of nearby Raleigh County, Beckley. One boy asks another what it’s like to live in McDowell County despite the expired energy and glory. His answer is bittersweet. “It’s a miracle,” he says, surveying the forest. McMillion and her team didn’t manufacture this moment--she wasn’t even with the boys when they shot the footage--but her team made it possible by reaching out. They took the time to knock down the small barriers between thought and execution so that the kids and all the older generations could activate their own extra content. If you’re short on time, watch the trailer for Hollow here. If you’re ready to settle in, launch the documentary. Ryan Sparks is the editor of Southern Glossary and suggests you sign up for the weekly e-mail that arrives every Sunday morning in time for brunch.